Two of the most fundamental tenets of the Jewish faith – as listed by Maimonides among the Thirteen Principles of the Jewish Faith – are the belief in the ultimate redemption, an awaited era of world peace, prosperity and wisdom, and the belief that the dead will be resurrected at that time. The Messianic Era will be ushered in by a Jewish leader generally referred to as the Moshiach (messiah: Hebrew for "the anointed one"), a righteous scion of King David. 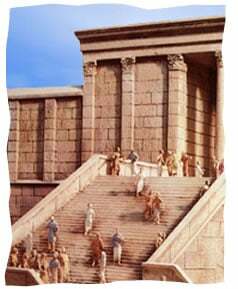 He will rebuild the Holy Temple in Jerusalem and gather the Jewish people from all corners of the earth and return them to the Promised Land. So it's going to happen—that's what we believe. But why is this important today? Why is the coming of Moshiach so central to the Jewish belief system?At that time, "delicacies will be commonplace like dirt." All the nations will "beat their swords into plowshares and their spears into pruning hooks. Nation shall not lift a sword against nation, neither shall they learn war anymore" (Micah 4:3). Humankind will be preoccupied with only one pursuit: the study of G‑dly wisdom. "The earth shall be filled with knowledge of G‑d as water covers the seabed" (Isaiah 11:9). Okay, so it's going to happen—that's what we believe. But why is this important today? Why is the coming of Moshiach so central to the Jewish belief system? Because the Torah teaches us that there is purpose to our world. And the Messianic Era is the actualization of that idea. There are those who maintain that this crass physical world is merely a strategic challenge; one that the soul must battle and transcend en route to a heavenly paradise. According to this line of thinking, the physical and mundane has no intrinsic worth, it retains no value whatsoever once its function has been fully served—it is a means to a spiritual end. While Jewish belief also speaks of the soul's reward in the hereafter, earned through its toil in the course of life's journey, it sees the refinement of the physical and the infusion of holiness and purpose into the mundane as the paramount objective. It is the sanctification of the human body and the world at large that constitutes the very purpose of its creation. From the dawn of time, G‑d envisioned for Himself a "dwelling place" right here on Planet Earth. And He put us here to fashion this home. To transform darkness into light. The curtain will be ripped aside, and all flesh will perceive G‑dAnd soon the day will come when G‑d's glory will be revealed in this nether-realm, and we will enjoy the fruits of our millennia-long work, the end-product of our labor of love. The curtain will be ripped aside, and all flesh will perceive G‑d. It will be the culmination of the master plan. The belief in Moshiach has sustained our nation throughout a 2,000 year exile fraught with pogroms, expulsions and persecution—our ancestors' firm belief in a better time to come, and their trust that they would be resurrected to witness that day. And today, finally, we stand at the threshold of redemption. One more good deed by one more person may be all that's needed to seal the deal. If he succeeds in the above, builds the Temple in its place, and gathers the dispersed of Israel, he is definitely the Mashiach." Additionally, the Talmud describes Moshiach as being able to judge by smell, and being a great prophet. "... There are some Sages who say that Elijah's coming will precede the coming of the Mashiach. All these and similar matters cannot be definitely known by man until they occur for these matters are undefined in the prophets' words and even the wise men have no established tradition regarding these matters except their own interpretation of the verses. Therefore, there is a controversy among them regarding these matters. Excellent Comments Thank you for sharing your excellent commentary. I only have one question, as I have not been educated in the Jewish Scriptures. What is the scriptural reference for "The curtain will be ripped aside, and all flesh will perceive G‑d? It is a true statement. I am not disagreeing, just looking for the reference to expand my readings. the sand in the oyster shell Recently Carl Jung's Red Book was published. Jung was a man who didn't believe in the existence of God. He "knew". He wrote about the collective unconscious. He wrote in his own words, in psychoanalytic terms, about consciousness and the stream, that is the River, that is consciousness. What we are daily perceiving, is deeply metaphoric of another story, a journey of soul. I am saying, we're doing a cosmic dance together, and that dance, is deeply part of a story we didn't write, but it is about the rub, how we shine, in dialogue, in investing ourselves in issues of ethics, and how we deal with complex ethical issues. It's about the reach, and I am saying, God wrote us all into a profound story that is going someplace deep. In synchronicity Jung saw something, namely a moving together through seemingly a causal connects, and he must have wondered, what's making this happen.